Open311 is a form of technology that provides open channels of communication for issues that concern public space and public services. Primarily, Open311 refers to a standardized protocol for location-based collaborative issue-tracking. By offering free web API access to an existing 311 service, Open311 is an evolution of the phone-based 311 systems that many cities in North America offer. Unlike the synchronous one-to-one communication of a 311 call center, Open311 technologies use the internet to enable these interactions to be asynchronous and many-to-many. This means that several different people can openly exchange information centered around a single public issue. This open model allows people to provide more actionable information for those who need it most and it encourages the public to be engaged with civic issues because they know their voices are being heard. Yet Open311 isn’t just about this more open internet-enabled model for 311 services, it’s also about making sure the technology itself is open so that 311 services and applications are interoperable and can be used everywhere. An Open Model Provides Transparency, Participation, and Collaboration. Some of the most prominent services and applications that provide this kind of non-emergency reporting functionality are FixMyStreet in the U.K. and SeeClickFix in the U.S.. However, nothing inherently limits this model to non-emergency issues. In fact, a system called Ushahidi uses this same open model for issue tracking and it played a central role in the rescue and relief efforts following the 2010 earthquake in Haiti. Yet even despite these significant precedents, we’re only scratching the surface of the level of civic engagement that Open311 technologies could facilitate. Imagine using these tools to not just report what is broken, but to also start a conversation about the overall health and livability of a community: reporting intersections that feel unsafe, marking where a new bike rack is needed, or even suggesting how a vacant lot could become a park. When appropriate, Open311 can even be used to manage volunteer efforts to help supplement government workers. Open311 also has the potential to be tied into the local knowledge-bases that many existing 311 call-centers use. Furthermore this technology could be connected to idea sourcing platforms like IdeaScale for uses such as community input in urban planning processes. Open Technology Provides a Standard Interface and Sharable Innovation. Many people have been inspired by the potential of the open model for 311 services and dozens of different applications have been built. In fact, many cities have developed their own iPhone applications to interact with 311 services. Because all of these applications were developed independently, they don’t work together and applications designed for one city cannot be used in another. Not only can this be frustrating for users of these technologies, but it’s frustrating for a programmer or anyone who wants to improve the system. Recently, many cities have begun to run open government initiatives, open data programs, and app contests to improve civic technology and civic engagement. In most cases, these initiatives open up data for citizens’ applications to read (such as to analyze 311 reports), but recently cities like Washington D.C. and San Francisco have begun to open up Application Programming Interfaces (APIs) to provide richer access to their data systems. An API allows citizens’ applications to interact with the same data that a city uses internally and to not only read data, but to query live data and even submit new information. This concept of a read/write API is what has fueled the growth of many new technologies, providing whole software ecosystems around platforms like Twitter and the iPhone. A read/write API is a prerequisite for allowing new Open311 applications and mash-ups to fully interact with a city’s 311 system. Yet in order for Open311 applications to evolve, there must be a common language, a standard protocol, to provide interoperability. An open standard is a fundamental part of Open311. A standard means that people can use their favorite app in every city and developers can focus on new features rather than different requirements for each city. Everyone can then benefit from new innovations built from a common foundation. 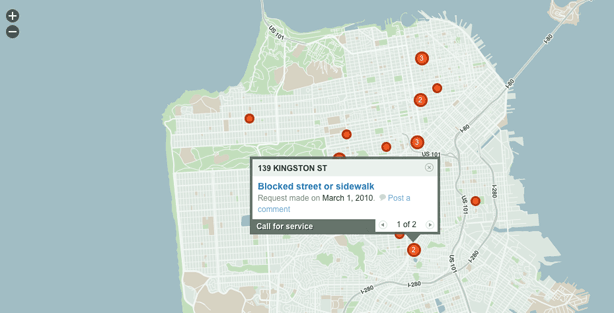 When a developer creates a new application to work with San Francisco’s 311 system, it should also work for Washington D.C.’s system, but people shouldn’t be forced to use any one application. Just as you can chose among many different Twitter applications and many different web browsers, you should be able to choose (or to create) the best application to interact with your city. These same benefits also apply to city managers. An open standard allows their internal systems to be more interoperable and it doesn’t lock them into any one system. The current Open311 API specification being implemented in cities like San Francisco can be found on the API page of the wiki. Open data and open standards like Open311 are all about increasing the potential of good ideas, empowering citizens, and allowing cities to do more with less.